Leah Calvert Talks About Having a Baby Boy! During a recent Twitter interview/ fan chat Leah Calvert of ‘Teen Mom 2’ shared her thoughts on what it’s like to have three darling daughters. Being surrounded by three girls under 5 years old could be considered a blessing or a curse depending on how you look at it! 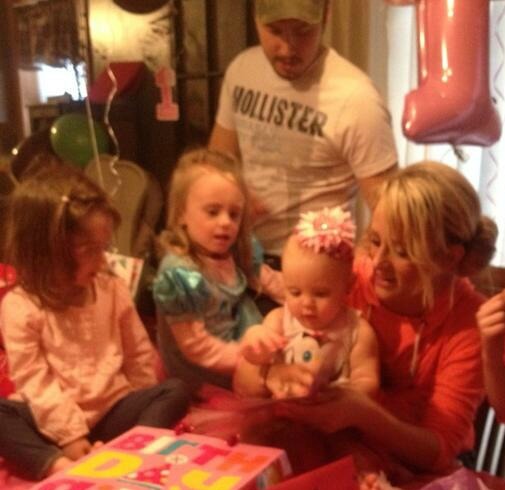 Leah and Jeremy are definitely not having another child right now, especially while deal with some financial troubles. (Which we will see this season on ‘Teen Mom 2’) However they do plan on having more kids in the future and it looks like they are ready to have another guy in the house! “Oh my I love having my girls. Their fun and when @Calvert505 is gone it’s all #GirlTime hehe but we hope to have a boy,” Leah explained. Previous Previous post: Nathan Griffith Talks About the Birth of Baby Kaiser!